4K gaming on a single graphic card is impressive, 8K, even more so, but neither have anything on a 12K surround gaming setup. Skeptics would be laughing at this point now, well allow me to add some more merriment to their humor, I am talking about a 12K setup at 60 frames per second constant. I am sure you must think I have lost my marbles by now, but that is exactly what AMD has achieved with their new Fury X GPU. LegitReviews have tried the GPU in a 12K @60fps configuration successfully in the recently released Dirt Rally game. 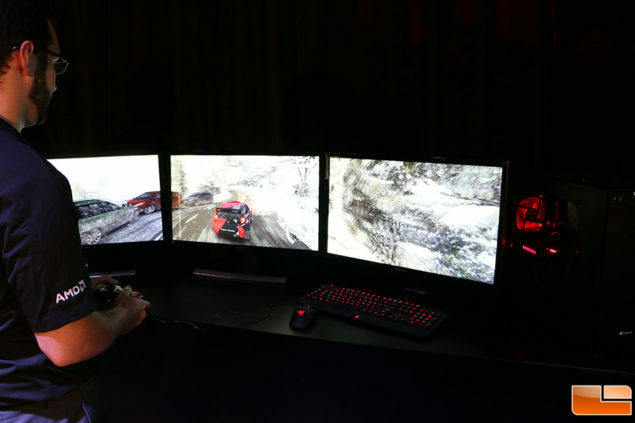 Just to clarify, these are three 4k monitors being driven at 60 frames per second constant by a single GPU. To drive the point home, these are 1.5 Billion pixels being refreshed per second. How is AMD doing this? well, the answer lies in the use of HBM memory and immersive graphics that are optimized for memory usage. This goes on to show that just how much of a difference optimization can make to games (because Dirt has never looked any more gorgeous than in this iteration). If every engine was as streamlined as this one, 4K @60 would have been a milestone we would have crossed by now. The general ideology behind developers currently however is to create highly immersive worlds with high polygon counts – and then downgrade graphics to fit the polygon budget and performance standards. The Dirt series has gotten the optimization-without-compromise part very right. I am afraid I don’t know the exact setting which were used in the Eyefinity demo but even if the settings were not maxed out, this remains a pretty big achievement. A dual Fury X Crossfire setup or the upcoming Dual-GPU Fury X2 would make mincemeat out of most games at 12K at the proper settings. And that is honestly something I never expected to see so soon. This AMD Eyefinity demo was conducted in 2013 with three R9 290Xs running the now-aged Dirt 3. These days however, a single Fury X is happily running the latest installment – something not even the dual GPU R9 295X2 could have achieved (45-50 fps is what AMD’s official numbers for this configuration are). It goes without saying that the 4096 super wide bus width most definitely has something to say about all those pixels running rampant on those gorgeous 4K screens. Being on the bleeding edge is very rarely a wise business decision – but if it pays off, it pays off better than anything else could have.